Yep, there I am on the right. About three years ago, I decided that I needed to overcome my hesitation/fear of sending out creative pieces of writing for reading by eyes other than my own. In chasing down the dream of becoming a published author, that’s something of a key point. The Fort Wayne Civic Theatre sponsors an annual Playwright Festival, so I took a story idea I’d had many years ago, and re-formatted it into a stage play script. I completed the entry form, attached the required first 10 pages of the script and clicked send. About a month-and-a-half later, I learned I was among six finalists. I was elated. I sent the requested full script, and waited. A few months later, I was notified that, while the rankings were very close, my play was not one of the three winners. I was a tiny bit disappointed, but really… at that point? I was just so excited to have been a finalist, I was perfectly fine with it. But my curiosity was piqued. Hmmm… what if I tried again? Again, I received a phone call letting me know I was a finalist, and I dutifully submitted the full script for consideration. A few months later, I (again) heard that it was very close, but I was not among the three place-winners. Still, I was flattered to find myself among the finalists once again. Several months later, I decided to give it one more try, and went through the drill of submitting the entry and partial script. I received another call to let me know I was among the six finalists, and, again, sent the full script. That was in mid-October 2014, and two days before Christmas – while on our annual family ski trip – I received a call from the Executive Director. Only this time, rather than learn I had just missed the cut, he told me I had placed. Only he wouldn’t tell me which place. “That,” he said, “will be announced in January on InSight.” InSight is a local afternoon news/talk show on television. Live television. Yikes. The day arrived, and I found myself with the Civic Theatre folks and Bob Ahlersmeyer, who is one of our community’s most excellent actors. Producers mic’d us and soon we were standing on set with the host, Dirk Rowley, and Phillip Colglazier, the Civic Theatre’s Executive Director. As Phillip began announcing winners, I watched the monitor and saw the third place winner’s photo, then the second place winner’s photo… wait a minute. If those two places are spoken for, which one of us two standing here… ON LIVE TELEVISION… have first place? I leaned over to Bob and whispered, “Well, *this* could end up being awkward, yes…?” I no sooner said that, when Phillip announced that for the first time in Playwright Festival history, there were TWO FIRST PLACE WINNERS! So, yes. I won. We won. 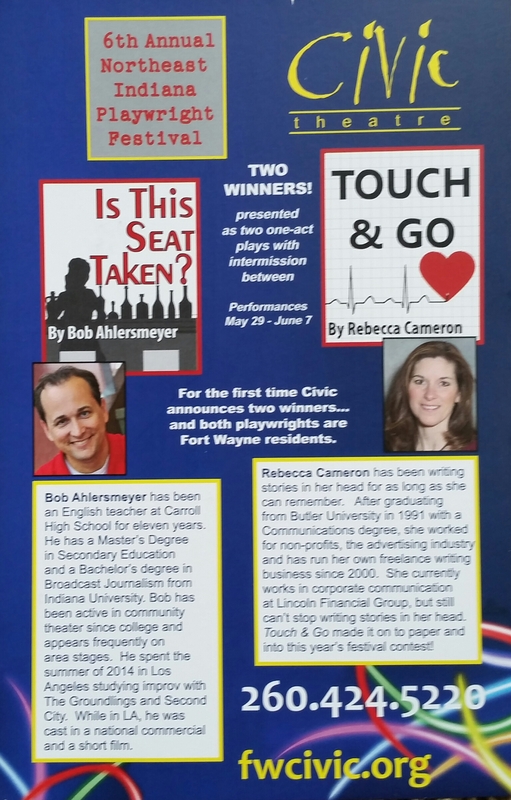 And both our plays are being performed on stage at the 6th Annual Northeast Indiana Playwright Festival. The festivities kick off Friday, May 29, and the plays will run the next weekend (June 5-7) as well. If you’re local/regional and are interested in attending, that would be awesome! I know some friends and family are planning road-trips, so come on out to Fort Wayne and we’ll make it a party! For more information on the Playwright Festival and/or attending any of the performances, you can visit http://www.fwcivic.org, or call (260)424-5220.